304 stainless steel probe, 3 inches in length. No external power required, or can be optionally powered for fast (non-parasite) operation. Chemical resistant steel probe and cable. The STPSR3-12 temperature probe is designed for general-purpose, wide temperature range applications. It is constructed of 304 Stainless Steel and has good chemical resistance properties to acids, alkalis, ketones, esters, aliphatics, aromatics, and outdoor exposure. 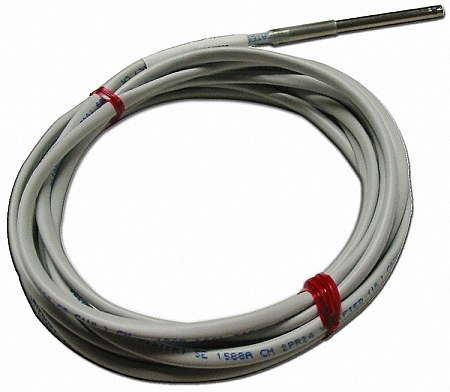 The STPSR3-12 temperature probe is comes with a DS18S20 embedded into the probe. It is manufactured using a special process which insures the internal sensor is thermally coupled to the steel tube wall; this helps insure rapid sensor response to changing conditions. The STPSR3-12 sensor is equipped with cable constructed of Teflon based materials for both the outer jacket and inner conductor insulation and is terminated with a RJ12 plug. The STPSR3-12 temperature probes are directly compatible with all Embedded Data Systems 1-Wire bus masters, including the HA7Net. For Detailed documentation on the embedded DS18S20 sensor, please refer to manufacturer’s spec sheet available at http://www.maxim-ic.com/. Dimensions (body diameter) .216 to .220 In.